But when you’re a junior or senior in high school, you’ll soon notice that the easiest thing for people to talk to you about is — you guessed it — college. Where are you going? What will you major in? And lastly, what will you DO with that? …What WILL you do with that, indeed. While some may argue that it is wrong to center what you do around how much money you will make doing it, I think the best reality is that you should find a way to utilize your talents in a way that pays for your lifestyle. It’s no secret that some majors make more money than others and I was curious to see exactly what majors make the most. …make sure to learn it our next FREE live webinar by clicking here! But keep in mind, the ways that one site averages a salary may vary from another. For example, Glassdoor lists the average salary of an Oncologist/Hematologist to be around $329K a year, which is more than PayScale’s average of $242 for that same occupation. These are wages that you can expect to earn over time with these degrees. If you earn your Medical degree and specialize in Oncology, SalaryGenius.com predicts that your starting salary will be around $210K. If the average medical school students’ debt really amounts to Cat Alford of Student Loan Hero’s $183,000, even with a starting salary of $210K you are on your way to paying it off. We also have an entire podcast focused on helping students explore different career options! Listen to it on iTunes on the way to school by clicking here! Have you been reading my most recent articles about STEM? It turns out that the highest earning careers seem to be in STEM, more specifically, the “E” of STEM — Engineering. According to multiple sources including Bloomberg and Forbes, if you’re an engineering major, you’re headed in the right direction. 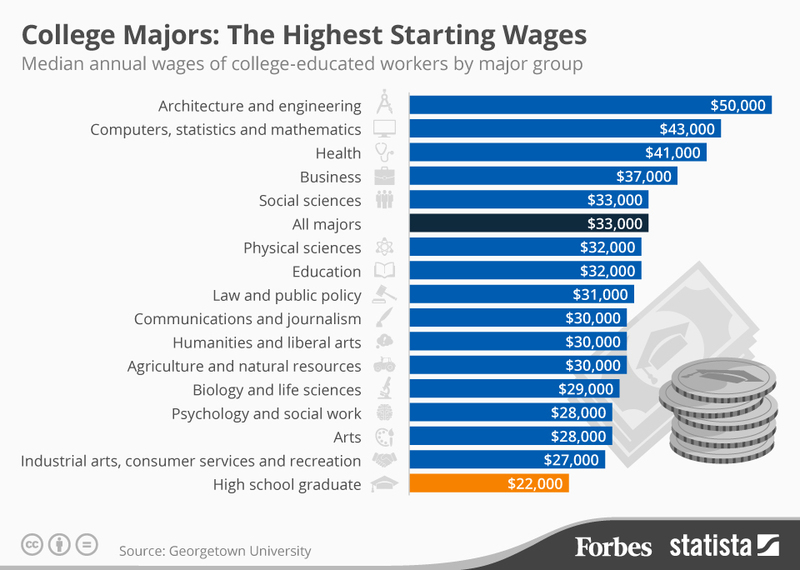 Nine out of the 10 highest-paying college majors are in engineering fields. But “engineering” is a pretty broad term, and there are a lot of sub-categories for you to choose from as far as what you’re actually interested in doing! 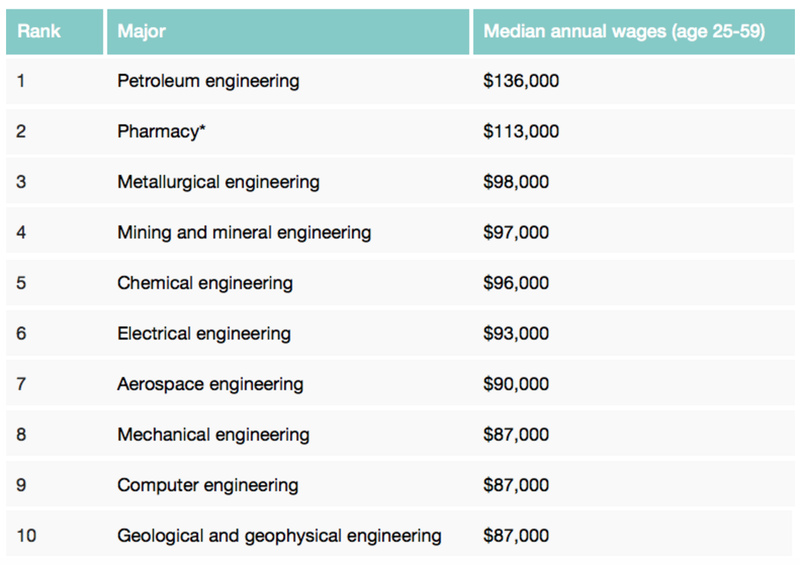 According to Fox’s article, you should look at these categories first (Not including “Pharmacy”, which is non-engineering) Petroleum Engineering is by far the top-earning engineering field. There is also another important factor to engineering being the top money-making major, which is wage growth. STEM majors don’t just make more money when they start out. They also see more wage growth over their careers than any other major. …But seriously, what does everyone mean by “Computers, Statistics, and Mathematics”? PayScale lists out the most common majors that associate with a job title accompanied by its median salary. 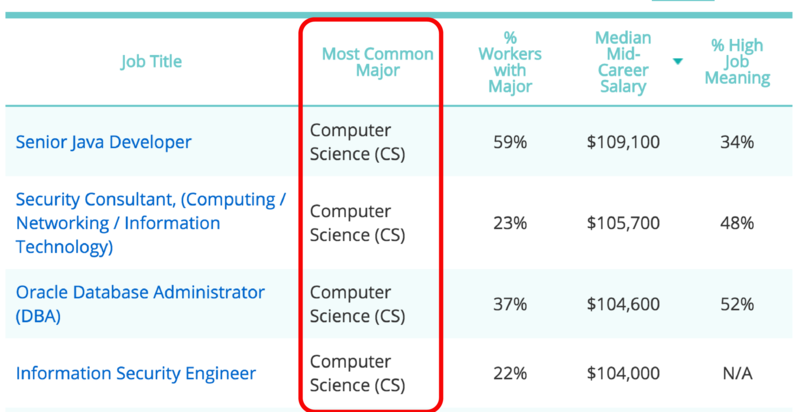 View the full list of common computer science majors. Most Statisticians continue on to get a more advanced degree. Master’s degrees are required for positions as Financial Analysts, Biostatisticians, Econometricians, or Data Analysts… Once you have your master’s degree, you can even choose to switch to another industry, like insurance, economics, or investment banking. This article by Inside Jobs provides insight into PayScale’s overall list of “Highest Paying Graduate Degrees by Salary Potential”, where “Finance & Real Estate” earn a mid-career salary of $143K, and Economics $134K. According to Sokanu, a career matching platform, you can earn around $130K annually as a Treasurer. Sokanu is also a great resource to find out more about these positions. For example, you may be wondering what exactly a mathematician DOES. Mathematicians work in government and in private science and engineering research. They work on teams with engineers, scientists, and other professionals. It’s interesting that Architecture is ranked in most lists as one of the highest earning salaries because many small Architecture firms do not feel that they are paid enough. The most influential factor affecting pay for this group is the specific employer, though experience level and location have a (lesser) impact as well. Naturally, Business Insider turned to PayScale again to look at the best paid salaries in business. This resulted in the chart below. View the full list of business majors and salaries. I think that for most of the categories here, you can at least get a general idea of what they are. But if you’re like me, you may have looked at the chart below and wondered, Social Sciences? What are those? Social science is a branch of learning that examines society’s institutions—their structures, theoretical foundations, evolution, and interrelationships—and how they affect and are affected by human behavior. There’s a lot of avenues you can go with these types of studies, but they fall into arguably 3 main concentrations: Economics, Politics, and Sociology. Getting IN to college is one thing — but where do you want to go from there? The college of your dreams is one big step in the direction of your bright future, and another step is landing the career you want most. It’s a big deal to get paid well to do something you love. So I strongly encourage every student to take a look at these major categories and the potential outcomes of their education! Are you a proactive parent or teen dedicated to ensuring college, scholarship, and career success for your student? Subscribe to our podcast Mentors 4 Teens on iTunes! Listen on the way to school! Click here to subscribe! 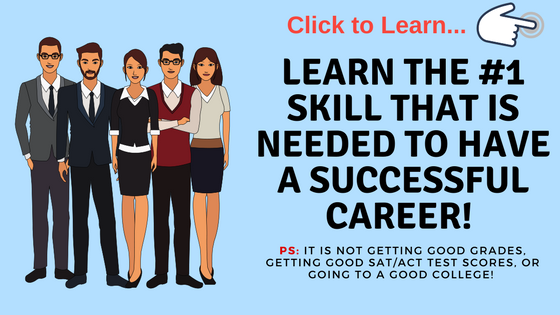 Register for our next live webinar to learn the #1 skill your teenage student needs to have a successful career! Click here to register! Do you think another major or category of majors should be included in this list? Let us know in the comments below!